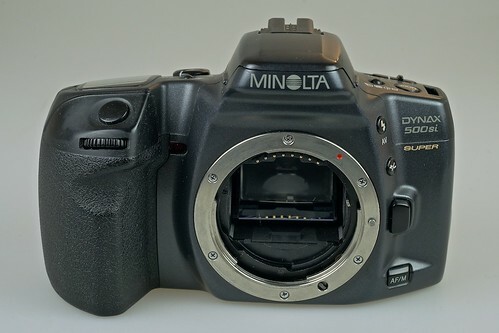 The Minolta Dynax 500si Super is a autofocus SLR camera for 35mm film made by Minolta. It was the same camera body as the Maxxum 500si for the American market. It was also sold at Ritz Camera stores and distributed as the Maxxum 530si RZ with a date back as well as the Maxxum 550si with date and panorama. The Japanese market version is called α-303si Super (Alpha 303si Super). The electronically controlled vertical travelling focal-plane shutter has speed of 30s to 1/2000 of a sec. with a flash sync of 1/90. The program exposure mode contains 5 separate modes including portrait, landscape, close-up, sport and night portrait. The metering is TTL based on a 8 segment honeycomb silicon photo cell with a range of 1 to 20 EV (ISO 100, f/1.4) and a spot metering range of 4 to 20 EV. 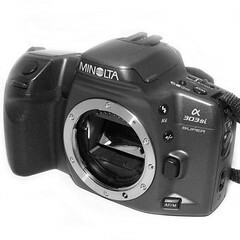 It can use DX encoded films with speeds of 25 to 5000 ISO. Non-DX films will use the previous films ISO setting. The film transport is motorized with film advance settings of single or a continuous drive speed of up to 1fps. Rewinding the film is automatic at the end of the roll, but a manual rewind is also possible before the end of the roll. The built-in flash has a GN of 12. An AF illumiator is also on the flash, that enables more precise focusing in darker conditions. The camera is powered by a 2CR5 battery. This page was last edited on 18 December 2013, at 05:35.